It’s a two-wheel city here in the capital of Taiwan (ROC). At the red light, motorcycles and scooters will file in on the stop line. 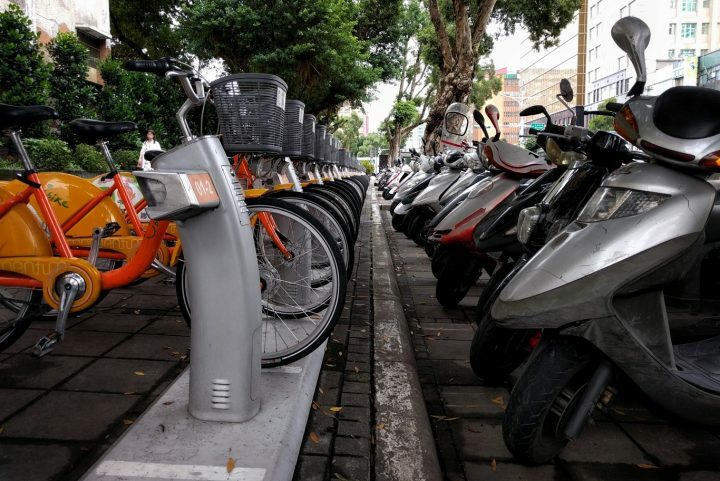 But in contrast to other metropolitan areas where a majority of the populace use two-wheel transport, Taipei’s traffic has an orderly, polite feel to it. Most of the time, traffic flows in a well-mannered fashion. 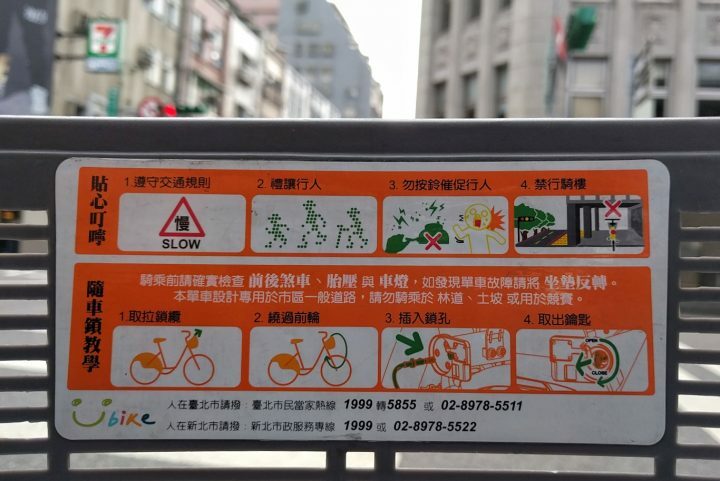 You won’t be pressured so much if you choose to go sightseeing on a bicycle in Taipei. 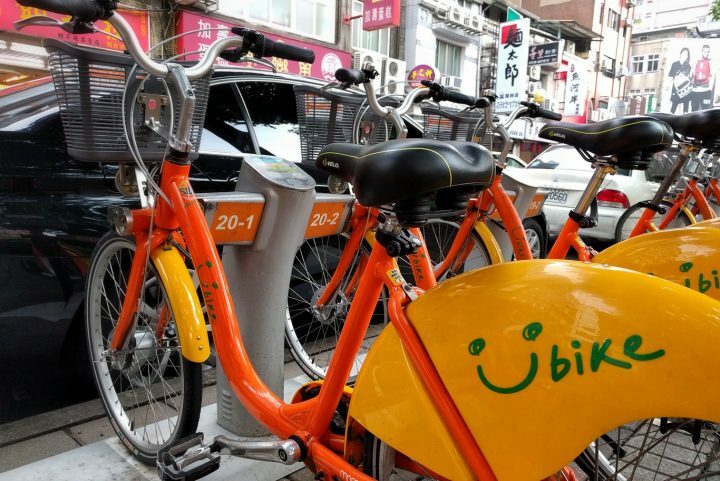 In 2009, Taipei’s department of Transportation launched YouBike to encourage the use of bicycles for short-term transport. Today there’s around 400 stations all over the city, and they’re easy to spot with their bright orange and yellow livery. I believe all stations have a kiosk to help you get on your way. Rates are inexpensive. Single rides start out at 10 NTD / 30 mins but will scale up to 40 NTD (after 8 hours). Short rides are very much encouraged here, so some station-hopping will help maximize the spend on the bicycles. But note the 15-minute cooldown after returning your bike to the docks. You can use a credit card to check a bike out through the kiosk. The process is straightforward, and you can select English. The bicycle itself is a standard 3-speed, step-through frame urban cruiser. However, there’s noticeably less heavy-duty parts, and so the bicycle feels lighter already — though I should verify the weight. The front-tire is also smaller than the rear, and claims to assist with handling. Standing it up is a two-prong kickstand, making posing a cinch. Riders can lock the wheels outside a station for a quick store run. The ride is quite balanced compared to other bikeshare bikes. Weight distribution is surprisingly decent, and it’s noticeable in situations like when mounting the bike. The three-speed hub is plenty for the city. There’s a refreshing nimble feel when on this bike — and it may be because it’s lighter. Overall, the sizing of this bicycle certainly fits the demographics of the region. It works well for the 5’6” me. Nonetheless, the adjustment options should make it work for taller riders as well. 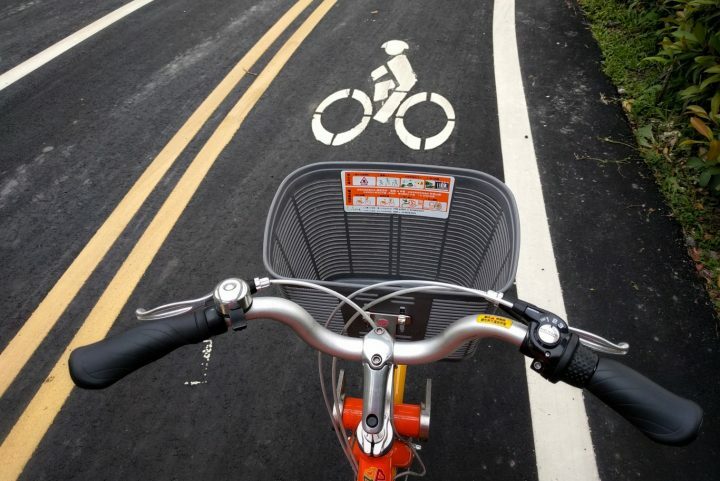 Most bike paths are centered around the rivers, so you’ll need to ride with road traffic. There doesn’t seem to be any regulations about riding on the sidewalk (please slow down), but expect smaller streets to have steps or parked scooters to navigate around. The city is mostly flat, but more than likely it’s the humidity that will work out a sweat. When you do tire of the urban landscape, many riverside parks have dedicated bike lanes for a more relaxed change of pace. The Taipei Metro (MRT) is an inexpensive and fast method to get around the city. In several areas, there’s notable distance between stations. Here’s where YouBike fits in as a last-mile transport to reach places between or outside the walking vicinity of a station. 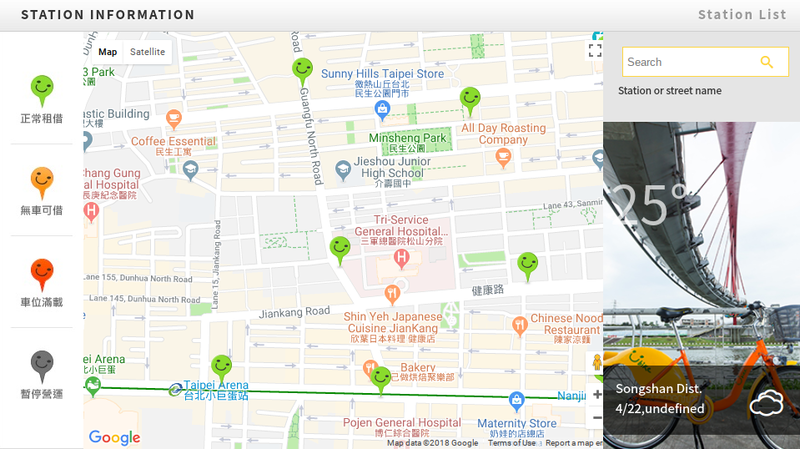 One example, the Sunny Hills store in Songshan is about a 15-min walk from the nearest MRT station. Alternatively, you could plan out a short YouBike excursion to cover ground. 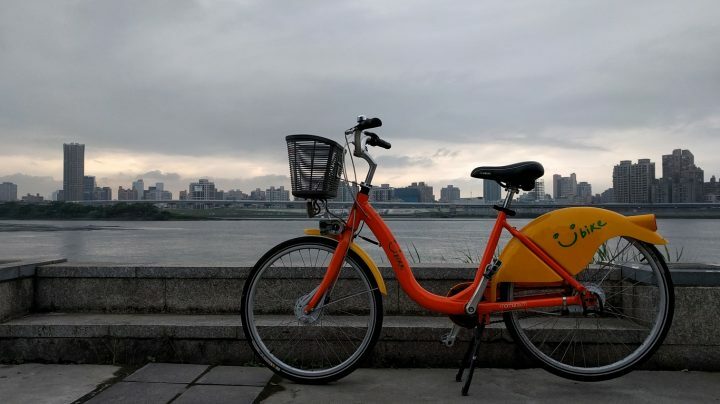 All-in-all, YouBike is a fantastic transportation option in Taipei. The distribution of stations facilitate sightseeing, the rates are inexpensive, and the ride is hardly cumbersome. The riding environment, which may seem daunting at first isn’t at all. I found a somewhat refined politeness from other motorists during my rides. Nonetheless, be sure to abide by road rules and stay alert. YouBike, U-Bike, or 🙂 Bike?